Aerial view of Tallacano - taken as we walked back. Last Saturday I went with one of our guests for a guided walk from Tallacano (near Acquasanta Terme) to Pizzo dell'Arco (1,011 m). 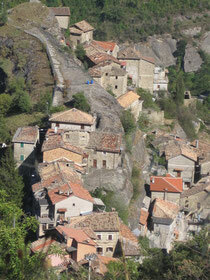 Thanks to our guide, Dino Gazzani, we had an interesting and informative walk as well as a panoramic one - for only €10. Tallacano is a village built onto the rock face many centuries ago when the people, threatened by barbarian invasions, abandoned the valleys for the mountains. From there we walked through chestnut woods to the tiny hamlet of Cocosia, first mentioned in official documents in 1039. After a short break to eat the figs from the tree and look around at the recently restored houses, we started the climb up to the Pizzo dell'Arco. This is the most panoramic peak of the Ceresa Mountains (also part of the Appenines) from which we could look down into the Tronto Valley and across to the Sibillini Mountains. It was here I discovered, courtesy of our guide, that what I had been thinking of as vertigo, was in fact my fear of empty spaces or cenophobia. Couldn't quite make it to the edge to look around....or over! We walked back to Tallacano via a different route, taking a detour to see the Sasso Spaccato or Split Rock. The track we were on seemed to form into a New York street of skyscrapers! This was the affect of the huge walls of smooth stone that stood up on either side of us. Like New York, there was even some grafitti....but engraved into the rock and dated 1178! A fantastic outing which we will recommend to all our Mela Rosa guests.